SAVANNAH, Ga. (AP) — Scientists watching for baby right whales off the Southeast U.S. coast have yet to spot a single newborn seven weeks into the endangered species’ calving season — the longest researchers have gone without any sightings in nearly 30 years. Bad weather that has limited efforts to look for whales could be to blame, rather than a reproductive slump. But scientists also worry it could point to another low birth year for the imperiled whales after a grim 2017, when 17 confirmed right whale deaths far outpaced a scant five recorded births. The National Oceanic and Atmospheric Administration estimates only about 450 Northern Atlantic right whales remain. The agency warned in December the species could face extinction without new protective actions. Researchers hoped for signs of a robust reproductive year soon after the right whale calving season began Dec. 1. But no calves have been reported off the Atlantic coasts of Georgia and Florida, where the whales typically migrate to give birth each winter. It’s still relatively early in the calving season, which has about three months to go. Clay said it’s the longest scientists have gone into the season without any calf sightings since 1989, when they began comprehensive surveys using trained spotters in planes to look for mother-and-calf pairs. Previously, the latest initial sighting was Jan. 1 — and that was during the dismal birthing season a year ago. 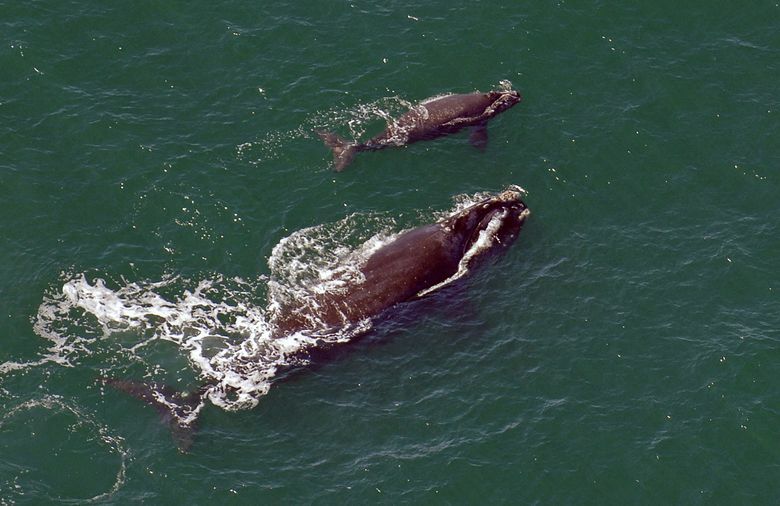 Right whales have averaged about 17 births per year during the past three decades. Since 2012, all but two seasons have yielded below average calf counts. The five births recorded last year were the lowest since 2000, when surveys found only one newborn whale. The reason no calves have been spotted so far this season may have more to do with the weather. Planes used for aerial surveys have often been grounded this season because of high winds and cloudy skies. George said weather conditions have cut the number of survey flights per week roughly in half. Barb Zoodsma, who oversees the right whale recovery program in the U.S. Southeast for NOAA Fisheries, said that’s why she isn’t worrying too much yet. Right whale reproduction can fluctuate greatly, year-to-year. After births bottomed out in 2000, the whales rebounded with a baby boom of 31 newborns the following year. One reason the numbers can seesaw so significantly is that female right whales typically give birth only once every three years or so. Without an increase in births, right whales appear to be dying faster than they can reproduce. NOAA scientists said in December than the population has been declining since 2010, with females hit harder than males. Many whales die from being struck by ships or getting tangled in fishing gear. Such deaths were the focus of a federal lawsuit filed Thursday by the Center for Biological Diversity and other conservation groups, who argued the federal government has failed to adequately protect right whales as required by the Endangered Species Act. Also concerning to scientists has been the scarcity of adult whales off the Southeast coast during calving season. George said it was common to see 100 adults or more during winters a decade ago. Last year, a single male whale was the only adult spotted in addition to the few new mothers seen swimming with their calves. The only sighting so far this year was an adult whale photographed by a man from his condominium window overlooking the Gulf of Mexico in Panama City Beach, Florida. Zoodsma said it was the first right whale seen in the Gulf since 2006, but no sign of an accompanying newborn. Meanwhile, the Center for Coastal Studies in Massachusetts reported a survey flight Tuesday identified 14 adult right whales in Cape Cod Bay, an important feeding habitat. While that’s more whales than are typically seen in the bay this early in the winter, Zoodsma said it won’t necessarily affect calving because pregnant females typically have already migrated south by now. She still hopeful newborn whales will turn up before the calving season ends in mid-April.